44. A box is given a push so that it slides across the floor. How far will it go, given that the coefficient of kinetic friction is 0.20 and the push imparts an initial speed of 4.0 m/s? Now, the normal force is just the weight of the box since this floor is level, which is F = ma, FN = mg, where g is the acceleration of gravity. s = ?, u = 4.0 m/s, v = 0, a = -1.96 m/s/s, t = ? 56.An 18.0-kg box is released on a 37.0o incline and accelerates down the incline at 0.270m/s2. Find the friction force impeding its motion. How large is the coefficient of friction? 30. A person exerts a force of 45N on the end of a door 84cm wide. What is the magnitude of the torque if the force is exerted (a) perpendicular to the door, and (b) at a 600 angle to the face of the door? 31. Calculate the net torque about the axle of the wheel shown below. Assume that a friction torque of 0.40 m N opposes the motion. 1. Three forces are applied to a tree sapling, as shown in Fig. 9-47, to stabilize it. If F1=282N and F2=355N, find F3 in magnitude and direction. F2 is a whole 'nother ball of wax. yarn. whatever. Note that the minus sign not only makes sense for the x component, as it would be to the left, but, it just comes from the cosine in this case. 4.How far out on a diving board (Fig. 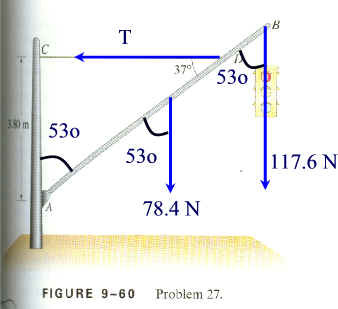 9-48) would a 60-kg diver have to exert a torque of 1000 mN on the board, relative to the left support post? 1000-mN = (588 N)r, r = 1.7 m, so she would be .7 m beyond the rightmost post. 5. Two cords support a chandelier in the manner shown in Fig. 9-6 except that the upper wire makes an angle of 45o with the ceiling. If the cords can sustain a force of 1300N without breaking, what is the maximum chandelier weight that can be supported? So, pretend the upper angle is 45o. Got it??? 6. Calculate the mass m needed in order to suspend the leg shown in Fig. 9-49. Assume the leg (with cast) has a mass of 15.0kg, and its CG is 35.0 cm from the hip joint; the sling is 80.5 cm from the hip joint. 10.A 70-kg adult sits at one end of a 10-m board, on the other end of which sits his 30-kg child. Where should the pivot be placed so the board (ignore its mass) is balanced? 11. Repeat problem 10 taking into account the board's 15-kg mass. If we ignore any tendency of the box to rotate. (can we?) this is just a force equilibrium problem. 13. Find the tension in the two wires supporting the traffic light shown in Fig. 9-52. Which is not solvable, as it has two unknowns. So let's set up Horizontal. But wait - there is a better way to do this. 16.A 0.60kg sheet hangs from a massless clothesline as shown in Fig. 9-53. The line on either side of the sheet makes an angle of 3.5o with the horizontal. Calculate the tension in the clothesline on either side of the sheet. Why is the tension so much greater than the weight of the sheet? 17. A door, 2.30m high and 1.30m wide, has a mass of 13.0kg. A hinge 0.40m from the top and another hinge 0.40m from the bottom each support half the door's weight (Fig. 9-54). Assume that the center of gravity is at the geometrical center of the door, and determine the horizontal and vertical force components exerted by each hinge on the door. OK - umm so let's talk about TORQUE! since t = Frsinq, and since rsinq is just half of the width of the door, we don't even need to know r which would have been the distance from the center of the door to the lower right hand corner, as it is only the horizontal part of r that matters. (Only the horizontal location of the center of mass matters). The weight, of course, exerts an anti clockwise torque about the lower right corner, and acts at half the width, or 1.3 m / 2 = .65 m, so we have a torque of -(127.4 N)(.65 m) due to the weight. 20. Calculate the forces F1 and F2 that the supports exert on the diving board of Fig. 9-48 when a 60-kg person stands at its tip. Take into account the board's mass of 35kg. Assume the board's CG is at its center. F2 = 3038 N = 3.0 x103 N upwards. 22. Calculate F1 and F2 for the beam shown in Fig. 9-56. Assume it is uniform and has a mass of 250kg. 25. A 170-cm-tall person lies on a light (massless) board which is supported by two scales, one under the feet and one beneath the top of the head (Fig. 9-58). The two scales read, respectively, 31.6 and 35.1kg. Where is the center of gravity of this person? The scales record kilograms, but they are really registering force, the left one is reading 35.1 kg, which means it is exerting an upward force of (35.1 kg)(9.8 N/kg) = 343.98 N, and the rightmost one is reading 31.6 kg, which means it is exerting an upward force of (31.6 kg)(9.8 N/kg) = 309.68 N.
343.98 N + 309.68 N - weight = 0 where weight is the weight of the person. x = 0.805 m from the top of their head, and 1.70 m - 0.805 m = .895 m from their feet. 26. A shop sign weighing 215 N is supported by a uniform 135 N beam as shown in Fig. 9-59. Find the tension in the guy wire and the horizontal and vertical forces exerted by the hinge on the beam. This is a full-sledged torque and two dimensional force equilibrium problem. Doesn't get too much finer than this. Grade A USDA all AMERICAN red-blooded, honest to goodness, no nonsense, no joking around, sure's shootin, God fearin' no-holds barred. OK you get the point. Well, let's look at the beam, and start with force. The vertical direction. The horizontal direction. No, let's start vertically, not that it much matters much where we start. DOES ANYONE HAVE ANY IDEA HOW TO SOLVE THIS HERE PROBLEM??? So. Ho boy. Two unknowns. One equation so far. Great. Just great. Another unknown. WELL, TORQUE ABOUT EASY!!! - uh that is one equation and one unknown. Wy = 215 N + 135 N - (542.24 N)sin(41.0o) = -5.74 N - So it was down after all. 27. A traffic light hangs from a structure as shown in Fig. 9-60. The uniform aluminum pole AB is 7.5m long and has a mass of 8.0kg. The mass of the traffic light is 12.0kg. Determine the tension in the horizontal massless cable CD, and the vertical and horizontal components of the force exerted by the pivot A on the aluminum pole. A bit of geometry or trig, the pole is 7.5 m long, but the cable is attached, hmm sin(37o) = (3.80 m)/hyp, so hyp = (3.80 m)/sin(37o) = 6.314 m from the bottom of the pole. The pivot acts at r = 0 so exerts no torque, so that leaves us the weight of the beam of 78.4 N acting in the middle (at 7.5/2 = 3.75 m from point A), the tension (T) of the cable acting at 6.314 m from point A, and the weight of the signal (117.6 N) acting at 7.5 m from point A. Notice that the downward forces act at a complementary angle (53o) with the angle the tension makes. 31. Consider again the ladder of Example 9-9 but with a painter climbing up. If the mass of the ladder is 12.0kg, the mass of the painter is 60.0kg, and the ladder begins to slip at its base when she is 70 percent of the way up the length of the ladder, what is the coefficient of static friction between the ladder and the floor? Again assume the wall is frictionless. A free-body diagram is shown in Fig. 9-63. So, let's set up our equations. Which yippee skippee is solvable for FW. ms = FGx/FGy = (352.8 N)/(705.6 N) = .50 - am I done yet?